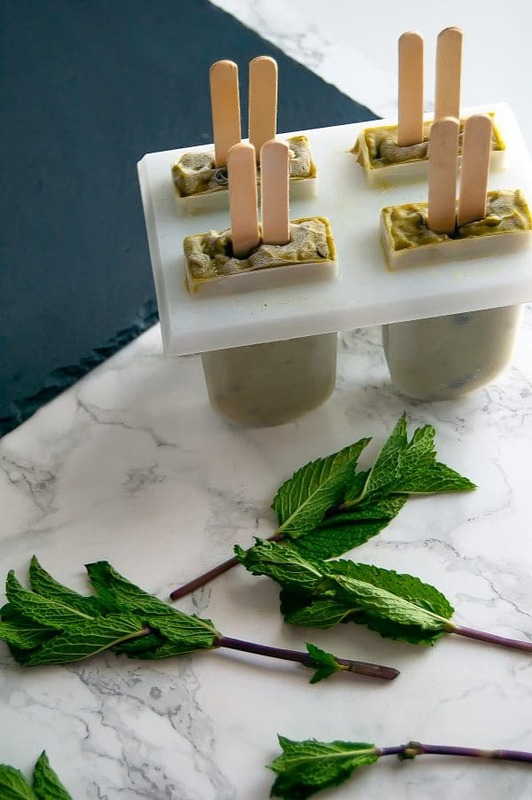 These mint chocolate chip popsicles have simple, food allergy-friendly ingredients for a healthy summer treat. It may not officially be summer on the calendar yet, but here in Florida it feels like summer is here. 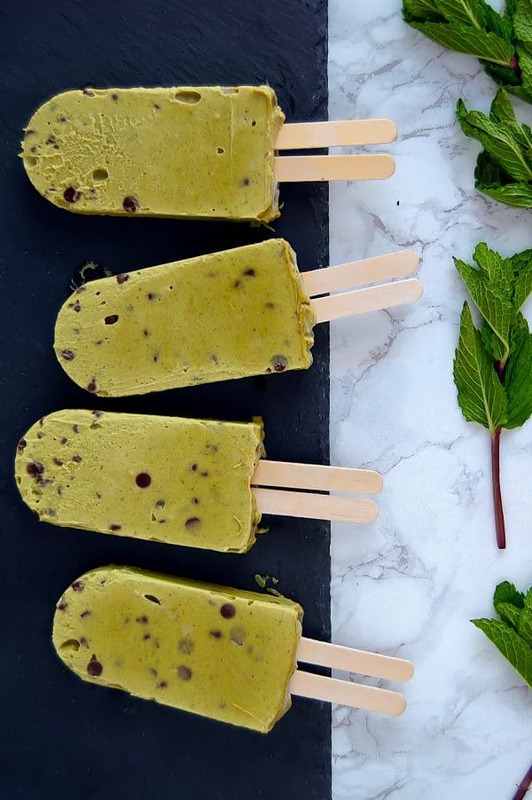 This means I’m craving all the light, refreshing, cold foods, including cool treats like these healthy mint chocolate chip popsicles. mini chocolate chips: of course you need chocolate chips with a mint chocolate chip popsicle! I use Enjoy Life semi-sweet mini chocolate chips (Amazon affiliate link), as they have just three ingredients and are free of the top eight most common food allergens. And while I haven’t tested this, you could try cacao nibs (Amazon affiliate link) instead of chocolate chips for a more bittersweet chocolate flavor without added sugar. These mint chocolate chip popsicles are definitely a healthy summer treat the whole family can enjoy with their simple, allergy-friendly ingredients! Now, I do just want to note that healthy is not synonymous with low-calorie. Just like weight is simply one number and not a comprehensive, diagnostic view of your health, calories are the same way. All they do is tell you how much energy is in a food – and that’s it. “Healthy” looks at ingredient quality, vitamins, minerals, nutrients, fiber, and more importantly – how those things relate back to you and your physical and mental health individually. 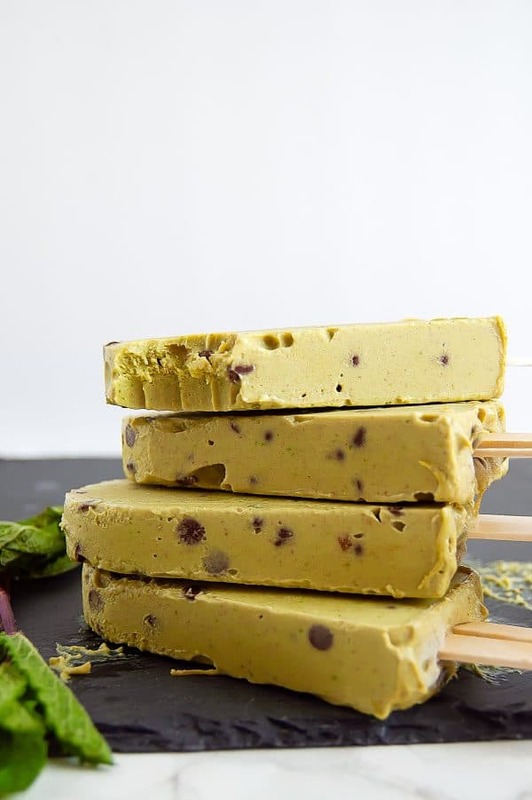 These mint chocolate chip popsicles in particular are very rich in healthy fats from the avocado, and that’s a good thing! In fact, your hormones reallllly like healthy fats, and you’ll find they fill you up longer! Plus there are certain vitamins, like vitamins A, D, E, and K, which need fat in order for your body to absorb them. I wrote the recipe for eight servings, because typically we’ll use smaller popsicle molds or use double popsicle sticks in larger popsicle molds (like shown here) and my daughter and I split one. For me personally, a little goes a long way with minty desserts! But do what works for you, and if that means enjoying a whole large pop – do it! 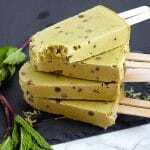 Give these healthy mint chocolate chip popsicles a try and let us know what you think! You can leave a comment and rate the recipe below, or snap a picture and share it to social media (tag @nutritiontofit and #nutritiontofit). Enjoy, and live well! P.S. Don’t forget to pin the recipe to save it to try later! 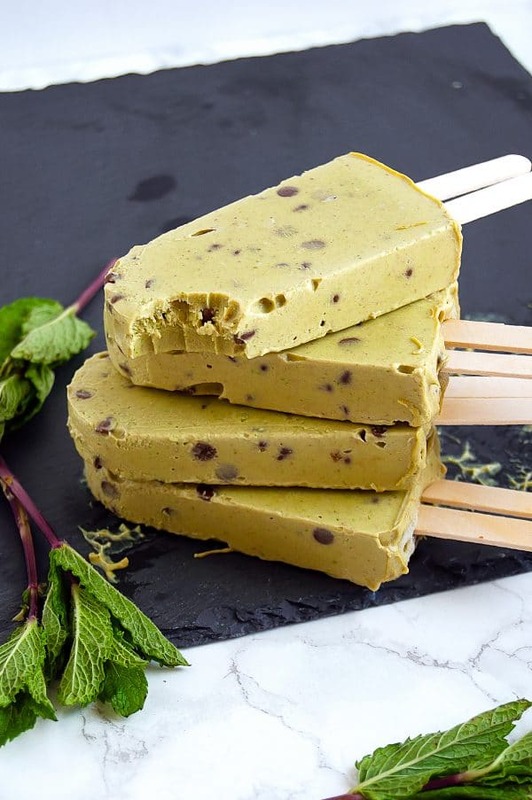 Healthy mint chocolate chip popsicles are made with simple, natural ingredients full of fiber, healthy fats, and fresh mint flavor! Blend avocados, dates, milk/ milk substitute, and mint leaves in a blender or food processor on high speed for 60 seconds, or until mixture is evenly blended. Carefully pour mixture into four large popsicle molds. The mixture will be thick, so I recommend using a small spoon to help, or using a piping bag to place the mixture in the popsicle molds. Place popsicle sticks in the molds, cover with lid (or with foil or saran wrap), and freeze at least two hours, or until frozen solid. To remove popsicles more easily from molds, run the molds under warm water for 15-30 seconds, or until popsicles have loosened from the molds. Store leftover popsicles in an enclosed, airtight container in the freezer up to one month. Nutrition information and allergies will vary based on type of milk or plant-based beverage you use.